We made the nearly two hour drive up to Hopkins for her quarterly CF clinic visit. We left the house at 8 am and returned home by 3:30 pm. Most CF parents and kids will tell you it's an exhausting day of many "what ifs" and many doctors. It's stressful because you never know what CF may bring to the table. Many tests that are routine are run but, they all factor in to the big picture of CF and give us all a good idea of how her lung health and cf is being appropriately managed. When we arrive, we sit in the general waiting area. (Madeline is required to wear a mask by her CF doctors so that she is protected from breathing in any germs that may be around the hospital. All CF patients must also wear masks so they cannot spread harmful bacteria to each other since the waiting room has many cf patients too.) 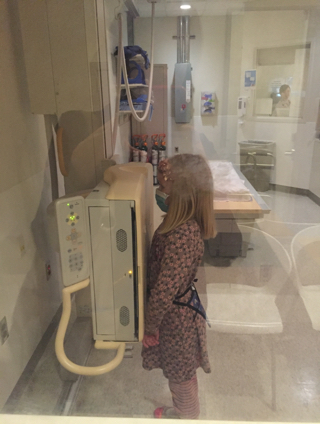 Eventually a nurse will call Madeline back to a small room where she will get her vitals. They weigh her. ( Her BMI needs to be over 50% as far as cf is concerned. Her doctors look for this and calculate her own BMI (as a high BMI is usually correlated to better/ higher lung function). Madeline has to eat twice as many calories to keep her BMI. She drinks two carnation instant breakfast shakes mixed with half and half daily with her meals just to maintain her weight. We also load up on butter on veggies, ice cream, and many other of her favorite high calorie foods to help keep up with the many calories she needs. In order to absorb all the calories she eats, she must also take pancreatic enzymes every time she eats. She usually swallows 5-7 pills during her meal times and a few more for any snacks as her day goes on. It's a fine balance between making sure she always has enough pancreatic enzymes per meals based on the fat/ calorie content alone in each individual meal or she would not absorb all the calories she eats. Thus, not gaining enough weight...it's a cycle and has a learning curve to figure out exactly how many enzymes she needs per meal. The nurse also measures her height, takes her blood pressure, measures her oxygen levels, and her temperature. (Pulmonary Function Lab)There they measure her lung function. Usually this gives her CF team of doctors and nurses a good idea of her overall lung health. Her Pfts should be similar each visit and if a decline is noticed it could be an indication of infection. Thus requiring oral antibiotics, impatient IV antibiotics, steroids, etc. After PFTs, the clinic nurse usually finds a room where we meet with the pharmacist who goes over each medication Madeline is currently prescribed, adding or changing dosing as needed based on symptoms, weight changes, etc. Next, we usually see a slew of doctors from her CF team. Sometimes we meet with them once a year or sometimes more depending on Madeline's needs are what the cf teams feels is best. After meeting with those other members of the team, we finally see her CF Doctor. There are 4 pulmonologists that make up the pediatric cf clinic but we usually see the same Doctor regularly, as he has followed and managed Madeline's cf health since we transferred to Hopkins CF clinic when she was 2 years old. We love Dr. R! He usually does a full exam. He listens to her lungs, looks in her ears, nose, and throat. We sit and talk about how Madeline is doing and about any concerns we may have. He discusses her BMI results as well as her PFT test results. All those factor into a piece of how her cf is being managed and how her health may be. Oftentimes, medicine may be added, taken away, new specialist doctors added in due to other issues that may be affecting her cf health. This is usually the time in the appointment when the doctor gives you an overview of what he or she may find concerning, overall good,and what parts of cf need work. Usually a plan going forward is given. This visit she was due for her yearly blood draw. She took it like a champ! Last, a throat culture or swab is taken from the very back of the throat. Sometimes Madeline is asked to cough. The swab looks like a long q- tip and is often waved down as far as they can go in the throat prompting cfers to have a gag reflex. Madeline handles this well every appointment but it isn't a "fun thing." The throat culture is usually "swabbed" and send out to the lab to see if any bad cf bacteria may grow on the culture. This helps doctors find and treat possible bacteria that could be wrecking havoc in the lungs. Sometimes that is the best and worst part about cf. A cf patient could look great on the outside health wise and exhibit very little symptoms but actually be culturing bad bacteria that could cause permanent lung damage over time if not treated. We usually have a wait 3-5 days after the cf appointment for a call or electronic update on the results of the culture. Based on the reading of the culture, a plan by the cf team is usually made as to how to treat the patient if something is grown on the culture. Oftentimes, more inhaled antibotic drugs, extra medicines, and sometimes an inpatient stay at the hospital for IV antibiotics and therapies are requested by the CF team. We also spend a lot of time occupying her younger sister, Audrey who is 2 years old. She doesn't have CF. 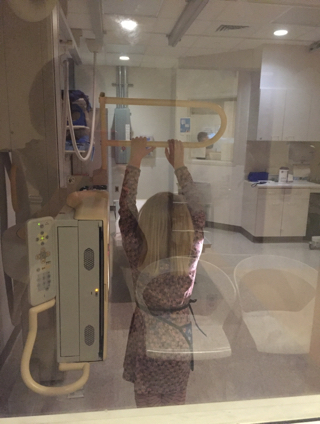 We try to spend time with the girls in between doctors, nurses, and staff coming in and out of the room since the actual visit last for hours in the same room. 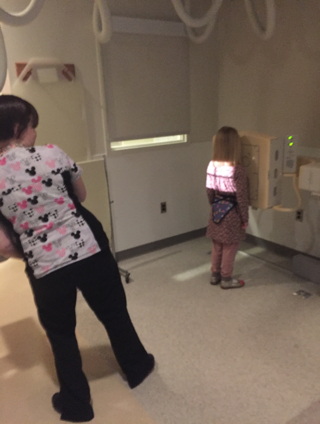 Overall her visit went very well this time.The CF team usually looks for a healthy weight gain in between cf visits. We constantly work to introduce fatty/ high calorie food to to keep her BMI above 50%. Madeline also works very hard to finish meals and push herself to eat/drink high fat items. Her lung function was similar to her previous visits which we were happy to hear. She also grew an a half an inch and 4 ft, 6 inches tall. Her doctor was pleased with her BMI of 80 and her height/weight ratio being in the 86 percentile. All those extra calories she is getting has been paying off. Overall, the cf team was very pleased with her health. Now we must wait for all the lab work and her throat culture to get a better idea of how CF is treating her on the inside. UPDATE: Thankfully, it only took 3 days for the results to come back ( usually the wait can be agonizing and longer) and Madeline's throat culture showed normal respiratory flora as well as Staph bacteria. We know the throat culture only gives us a "sample" of what she may harbor in her lungs but, we are thankful for this good news. The staph bacteria is not typically treated in CF patients unless she develops symptoms such as coughing, lower lung function, etc.Thus far, we have not seen any indications that the Staph is effecting her CF health. We are thankful that her throat culture came back good. We always hope for good cultures so we can limit the amount of medicine she is on, hospital admissions, and lung damage. 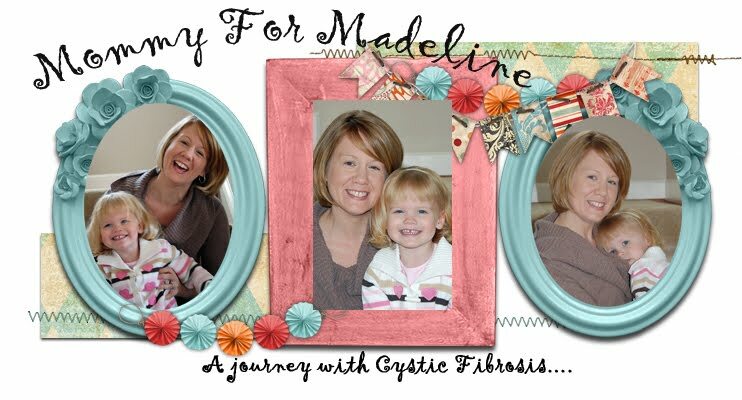 We are so proud of Madeline and the amazing CF fight she shows daily. She has grown to be her own advocate for CF and takes more responsibility when talking to her cf doctors about her health. She has learned how to dose her own enzymes ( according to the food she is eating), she reminds others that she needs to wash her hands, and overall is proud to share about her CF when asked. 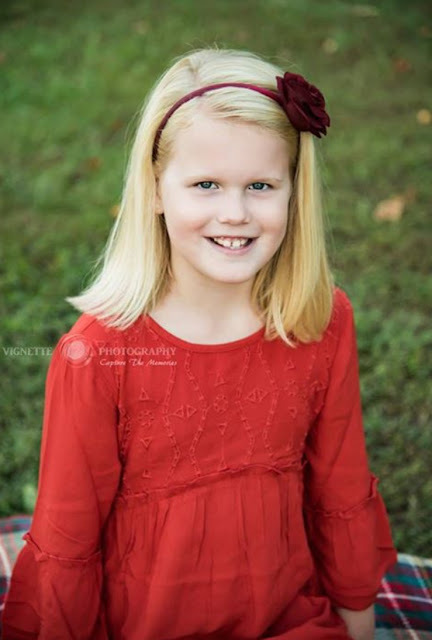 We are so thankful for the great care she is receiving at Hopkins and at her new school, Wilson Elementary. Her teacher, ENCORE staff, nurse and the administration there have been so supportive and proactive with Madeline's care. It takes a village to fight CF! Thanks to everyone for the many thoughts and messages as we awaited her results. We appreciate the care you show for Madeline and our family because as we know, CF can take some unexpected turns at short notice.